From humble beginnings to the forefront of innovation in Sri Lanka, Prof. K.K.Y.W. Perera, a veteran in the fields of engineering and electronics, is up for the prestigious Ray Award in August, for his creation – the three-function smart fan controller. Prof. Perera’s focus has always been on conserving energy and improving energy efficiency but his inventions have not always been met with commercial success. Charting the difficult path of the modern day inventor, he described all the challenges he faced as a young boy in the village as well as a distinguished academic battling to turn his ideas into triumphs. 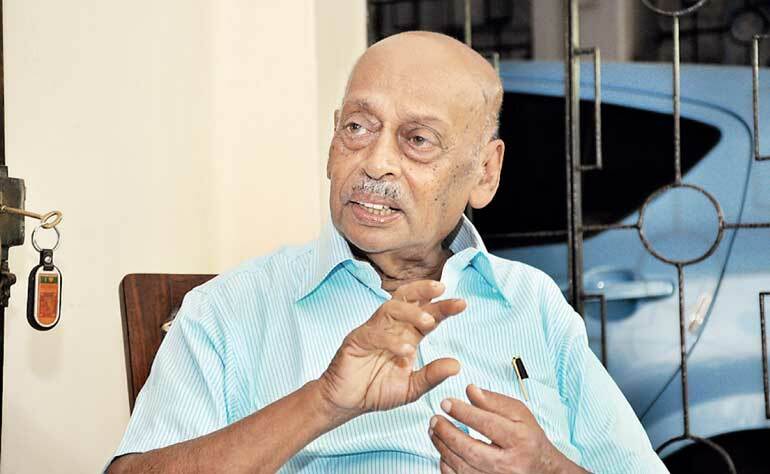 Prof. Perera was born in the village of Kannimahara, about eight miles into the interior of Yakkala, where he attended school in nearby Radawana until Grade 3. He later received a scholarship to Ananda College, Colombo in 1941. He excelled academically at Ananda College where in 1949 he was awarded the Gold Medal, an award given to the best student at the college. Even during his early years, Prof. Perera showed an incredible ingenuity as well as a keen interest in innovative engineering. He recalled one of his first creations with great fondness – a wheel powered by a small stream of water; the oscillatory motion was transmitted by ropes and was used to ring bells to scare off birds and vermin from the nearby vegetable plots. “From a young age I was attracted to innovative thinking. One thing I was always drawn to was the appreciation I received when I created something to help people. I also believe that innovation is in every child in a similar way,” he said. He pursued his higher studies at the University of Ceylon where he received his BSc Engineering degree with first class honours followed by his MSc from the University of Birmingham and his PhD from the University of British Columbia. Prof. Perera also had an extremely distinguished professional career, serving terms as the Chairman of the Sri Lankan branch of the Institution of Electrical Engineers UK, General President of the Sri Lanka Association of Advancement of Science and President of the Institution of Engineers. Furthermore, he was the first Dean of the Faculty of Engineering and Architecture at the University of Moratuwa and served terms as the Chairman of the Ceylon Electricity Board and Chairman of Sri Lanka Telecom, among other institutions. He was also the Secretary of the Ministry of Power and Energy for around 10 years. He was bestowed with several national and international awards as well including the Vidya Jyothi national honour. It was during his professional career that Prof. Perera identified the pressing need for energy efficiency and conservation. Among some of his early inventions were the light-activated switches for street lamps and the automatic timeout devices for electronic appliances and lamps. His fascination with electronics began at a young age which together with his passion for energy conservation led him to the invention of his Presidential Award-winning invention of the three-function smart fan controller. “With my experience at the CEB and the Ministry of Power and Energy I knew it was very important to conserve energy. Efficient use for resources, not just energy, is extremely important for the planet. My research and experiments finally led me to this creation,” he explained. Prof. Perera stated that the timer on the microwave oven inspired him to think of ways of preventing unnecessary energy wastage on other commonly-used household appliances such as light bulbs and ceiling fans. The Professor mapped out the gruelling process of bringing an idea of this magnitude to the level of commercialisation. From the four years he and his team spent developing the idea, testing and researching, to the great expense of improving early prototypes and small scale production, Prof. Perera explained how the simple conception of an idea, no matter how brilliant, does not guarantee commercial success. His three-function smart fan controller aims to control the speed and time that ceiling fans remain active. With the compact replaceable plate, which substitutes the standard fan regulator, the consumer can adjust the fans speed and the number of hours it remains active thus reducing the chances of wastage. “Good housekeeping is one way of conserving energy – switching off the electrical appliances once you leave the room or have finished using them. It is not always applicable though, because people tend to forget, leaving their fans and lights on,” he said. Prof. Perera who has fitted his home with this product stated that he usually sets his bedroom fan for two hours when he goes to sleep which meant that he would sleep through the time the fan was inactive and unwittingly saved energy and money in the process. The fan comes with three main functionalities – the speed control function, the variable timer for automatic switch-off and a manual on/off switch which doubles as a time reset function. The device is also geared for high efficiency energy saving with its solid state integrated circuit which uses near zero power. The controller needs no batteries and is completely silent unlike other regulators. A small LED indicates when an auto-stop has occurred at the end of preset time while a simple switch can be used to start, stop and restart the fan. The product is also compatible with all brands of ceiling fan. He hopes that his product will be widely used in Asian homes, which traditionally use ceiling fans, so that families will be able to cut down on energy consumption and save money. Prof. Perera said that his research was supported greatly by the University of Moratuwa, the National Science Foundation and the Sustainable Energy Authority. The product is currently available at Cherry Electronics on Kandy Road, Kalagedihena, Majestic Electric Company in Bambalapitiya and Institution of Engineers (IESL) Sri Lanka on Wijerama Mawatha, Colombo 7. Prof. Perera is one of four inventors who have been shortlisted for The Ray award which will be handed out on 24 August. The award is given out by the Ray Wijewardena Charitable Trust along in association with Commercial Bank which would award a credit line of Rs. 1 million to assist the winner to prepare his/her invention for commercialisation.